We are unable to deliver this product outside the UK. 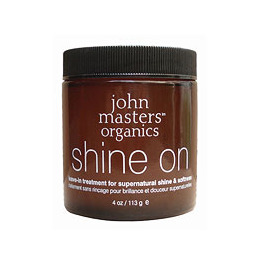 John Masters Organics Shine On is a leave In treatment for supernatural shine and softness. This natural, leave-in hair treatment uses organic kelp in place of synthetic silicone to smooth the hair shaft, leaving hair shiny and soft, all day long. A great natural-shine alternative to petroleum-based products. 6 additional certified-organic plant extracts help condition the hair. Safe for colour-treated hair. Caring about yourself and caring about the earth don`t have to be mutually exclusive. For over 15 years, this has been the guiding force in creating Super Natural Beauty for your hair and your skin. John Masters Organics grew out of a desire to create a luxury beauty line that treats the earth with respect. The result is the culmination of the hard work performed by people all over the world. Their dedication to growing and harvesting organic and wild-crafted ingredients is honoured at John Masters Organics. We only get one body, and we only get one planet. Why not treat them both with the utmost care? You will never see artificial colours or fragrances in the ingredients. In addition, all of the John Masters Organics packaging uses the minimal amount of ink possible and is printed on 100% recycled and unbleached paper. By creating products that are biodegradable and packaging that is recyclable, you can rest easy knowing that what you put into the earth is as clean as Mother Nature intended it to be. Always natural, always earth-friendly, and always with your beauty and health in mind. John Masters Organics Shine On - Leave In Treatment - 113g. Aloe barbadensis (aloe vera leaf juice) gel,* aqua (water), glycerin, guar gum,* sodium alginate, daucus carota sativa (carrot) seed oil,* olea europaea (olive) oil,* calendula officinalis (calendula) extract,* anthemis nobilis (chamomile) extract,* xanthane gum, methylcellulose gum, macrocystis pyrifera (kelp) extract,* marine phytoplankton, fagus sylvatica (beech) extract*. Apply to wet or dry hair and style as usual. Add more as needed for increased softness and shine. Below are reviews of Shine On - Leave in Treatment - 113g by bodykind customers. If you have tried this product we'd love to hear what you think so please leave a review. 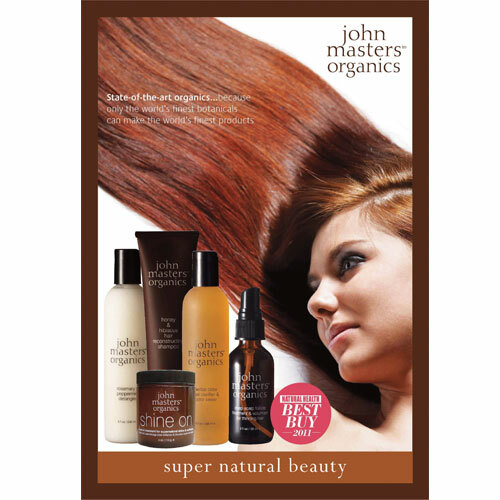 John Masters Organics Shine On is a leave In treatment for supernatural shine and softness. Uses organic kelp in place of synthetic silicone to smooth the hair shaft, leaving hair shiny and soft, all day long. A great natural-shine.